The EUCROWD project consortium is pleased to announce that the final report and information on implemented activities are now available. The comprehensive list of results of the EUCROWD project is available here. We would like to cordially thank to all 437 participants from 22 EU members states and 14 non-EU members states (including 185 young people) for taking their time to directly participate in the project and for contributing their expectations, opinions and ideas on using crowdsourcing in debating the future of Europe. The brochure also calls to action for individuals and organisations interested in e-participation of citizens in politics and policy with a focus on the application of crowdsourcing in fostering a democratic debate on the future of the European Union. 1. Recommended EU policy fields / topics that could be crowdsourced: Environment and Healthcare (e.g. air quality). Both are affecting daily life of EU citizens and are representing shared competences of the EU. 2. 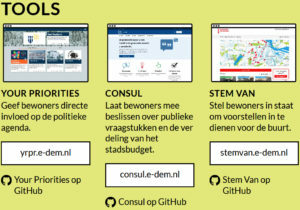 Recommended tools / platforms to be used: a single platform at the EU level which should be transparent and open-source, multilingual, include multiple ways of participation and contributions, scalable and user-friendly. 3. Recommended time frame / democratic policy cycle phases: “issue identification” by collecting ideas and “policy formulation” through solutions identified by citizens. 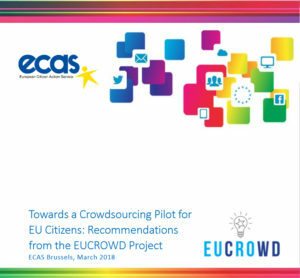 The document Towards a Crowdsourcing Pilot for EU Citizens: Recommendations from the EUCROWD Project (pdf) was presented and discussed with relevant EU decision-makers and interested stakeholders at the concluding EUCROWD conference in Brussels. 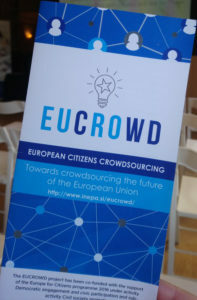 Several citizens crowdsourcing cases and platforms at the national level relevant for a crowdsourcing pilot at the EU level were identified, presented and discussed during EUCROWD events. The list of 12 cases from 7 EU countries is available at http://www.inepa.si/eucrowd/results/#Cases. disseminate widely and provide multilingual communication.